We all love statistics – especially when it comes to video games selling records. Everyone has hope that best selling pc games on steam will contain their favorite title. A few days earlier Valve has presented best selling PC games for PC on the Steam platform. 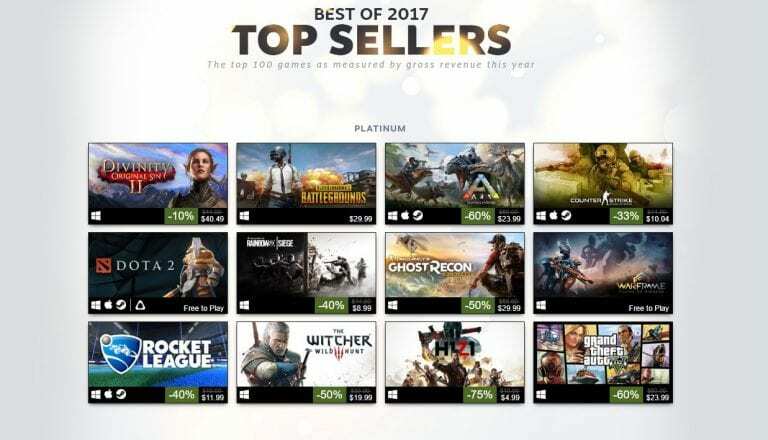 Among the games that were included in the top 10 list, you can find such productions as Counter-Strike: Global Offensive, PLAYERNOWN’s Battlegrounds, GTA 5, H1Z1, Dota 2, Ark: Survival Evolved, Rocket League, or Rainbow Six: Siege. The list does not include products from other manufacturers such as Riot or Blizzard Entertainment League of Legends or Overwatch. You can view the full list on the official website of the Steam platform, where you can also see items from the gold, silver or bronze lists.